Thanks for your information and opinions. The tripod with the ball head woud come in handy for my smaller lenses. I could remove the ball head, and place the gimbal head when I want to use the camera/Sigma 150-500 to do Astrotracer if I need to. I am not planning on getting either the tripod or gimbal head yet, but if I do at least I will know what I am buying and how to use it. I may even consider the Wimberley if I want to, depending on what I really need and how my budget is. Thanks again for your advice/help. I appreciate it. Last edited by C_Jones; 11-03-2015 at 03:24 PM. There are many cheaper options than wimberley head, and you wouldn't notice much difference between them so I recommend a cheaper head. I suppose the gimbal would provide almost as much if not as much versatility as the Wimberley head. That is what someone said in a video I saw about the gimbal head. I am sorry, when I have been referring to Wimberley, I was referring to the Wimberley WH-200 Gimbal Tripod Head II with Quick Release Base. I realize now that it is also a gimbal head. I suppose there is a trusted brand or brands for gimbal heads. Oben, Wimberley, and Jobu are some listed on B and H. A couple of those brands plus Movo, Promaster and Cowboy Studio are on Amazon which have cheaper prices. There are other brands making cheaper ones which will work just as good for your purpose. I'm interested in this as well, but the Vanguard is a fail for me because it doesn't have an Arca Swiss compatible head. I thought I'd be able to find something heavier, and more stable, but it's like everything is a 5 segment light weight travel tripod, or a ridonculously expensive video tripod. Is there no Arca compatible, very stable tripod in the same price range as the Vanguard? I've used the DA* 60-250mm with the Astrotracer -- I think the max I got was 120 seconds @ 250mm. It certainly helps to be far from a major city as the glow affects how "deep" you can see. I would suggest keeping things to well under 300mm until you perfect the technique. I have a Pentax 16-85 lens I bought recently that I may use for some landscape/star combination night shots I noticed it does not have an infinity symbol on the barrel, but I will make due with a focus on a star before doing a long exposure if I have to. I've been getting into the night sky stuff and I regret not getting a beefier tripod. There's a lot of emphasis on light weight stuff, but that of course usually means a sacrifice of stability, even if you're spending bank for unobtanium legs with an anti-gravity ball head. Shoulda kept the two-section legged behemoth I had years ago...sigh. B&H has the rather beefy, but discontinued Auctus Vanguards on sale relatively cheap for legs only. They are quite robust, and have the now-rare geared center post. So that leaves heads. Maybe consider a pan/tilt, it might make it easy for more extreme vertical. The gimbal is gonna help over most ball heads with really heavy stuff, but you don't seem to be there. Some of the beefier ball heads might work fine, and there are now some gimbals for relatively cheaper, some people are getting good results with some of them. At the weight of your gear the gimbal might be more cost effective than the ball. The problem is that it's really difficult to judge these from specs; the max weights manufacturers list are pure nonsense and can't be used as a basis of comparison, except very generally. Try to find a user who has that same lens, even if on a different body, and see what's working for them. I have a Manfrotto Nord Bogen 3001 Professional Tripod that I have looked at that I bought somewhere about 1989. It has a three way head. Where it connects to a camera/lens it has cork on the base, and the screw on the base has adjustable positions. I tried mounting my Sigma 150-500 and K-3II on it using the foot of the lens holder and it held it securely and steady. I suppose my 16-85 with my K-3II or K-5IIS would have no problem doing star/night photography mounted on it. The head uses these really nice sturdy arms that have the screw handles on each one. This looks like a reasonable option for me. The tripod legs are metal and have screw handle securing, and the heads can be interchanged by removing the screws underneath the head securement and unscrewing the head itself. The weird thing about the Astrotracer is that your max exposure times can differ depending on where you point it. Logical when you think about it, but strange if you're used to equatorial drives. I keep meaning to point it at Polaris to see if it'll figure out that it has to twist the sensor rather than linearly displacing it. I've been using a bog-standard medium-weight travel tripod, so long as I use the 3s remote to trigger, I don't see any shake. You can do a fair bit in 30 seconds! Took this just the other night, M31 with a series of about 20 29-second exposures stacked for noise reduction (Photoshop, Smart Object, Median filter). 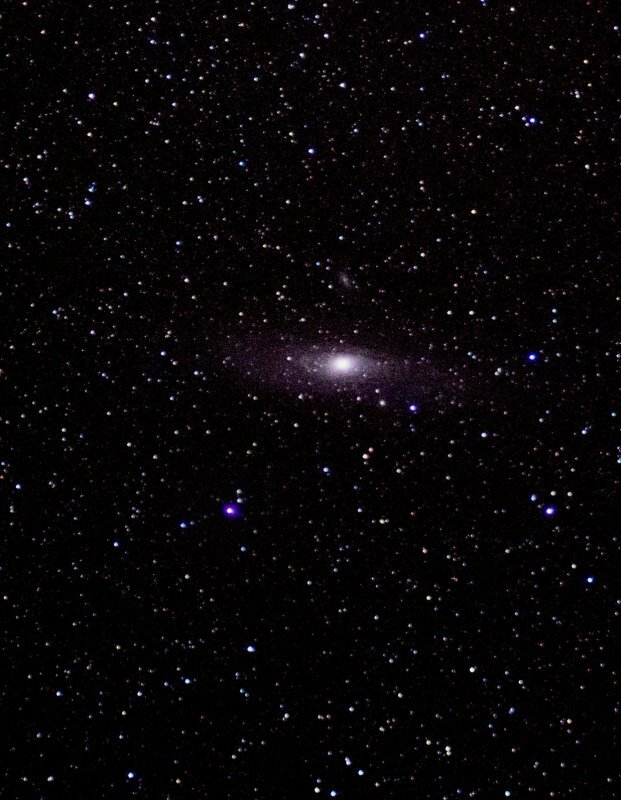 This, admittedly, was piggybacked on a friend's 8-inch Celestron. Something like a 50% crop from a 200mm lens. Not a prizewinner, but certainly recognizable as a galaxy. 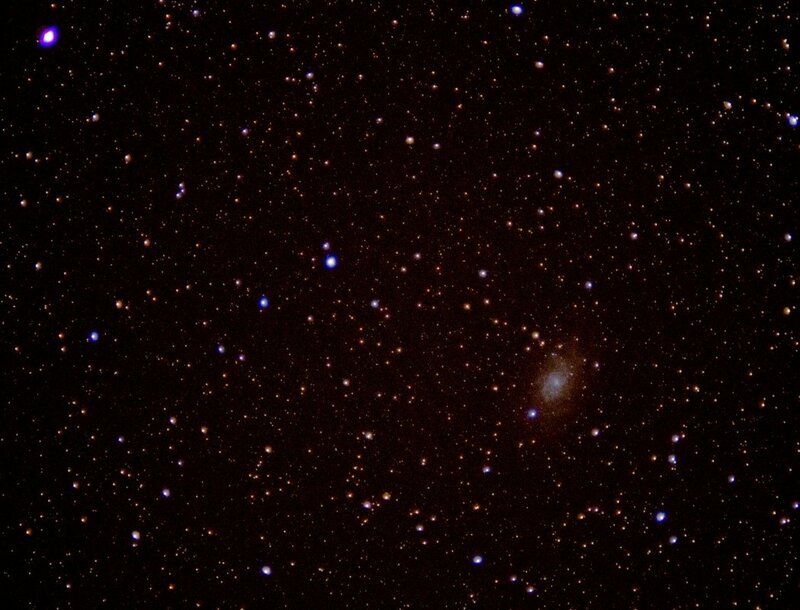 From the Astrotracer in a good mood, here's the Triangulum Galaxy, M33. 135mm f/2.5 "Bayonet" (again, cropped from the original). Can't see any shake or trailing there, also 29 seconds. I was going to test with the 30 second timing. I guess that is as much as I can do with the shutter delay on my camera itself. If I want to use longer shutter speeds I suppose I would have to use Bulb mode and a remote. Landscape/ Astro combinations seem like an interesting option. I may test with and without Astrotracer on different occasions to see what does well. I have a Sigma 150-500 and my 16-85 so landscape/astro and some telephoto is what I may pursue. The Moon is something that I may use the 30 second or less timing for. Thanks for the galaxy examples. Some people have told me that a ballhead would be enough for the telephoto, but I may stick with my Manfrotto three way head for now. Nice stuff. I wonder if some of the tetchiness is due to location inaccuracy, especially since some orientations would be more forgiving than others due to angular velocity I guess. But the fact this exists at all boggles me. Really brilliant.